The RV community is known for sharing ideas which solve or deal with situations. The willingness of others to pass along their experience is what makes it easier for those new to the RV lifestyle to settle in and enjoy it. In this TechTip, I am passing along a couple of tips that I found helpful. I hope that you will find them beneficial as well. On many diesel-powered coaches with air brakes, there is an Air Dryer mounted near the air compressor which exhausts the moisture in the air system. This Air Dryer blows off a concentrated exhaust of water and air directly towards the ground. If the coach is parked over loose, fine gravel or dry, dusty soil, the force of the exhausted air will completely clear a small round area below the Air Dryer of all the loose gravel or dust. The first photo shows the location of the Air Dryer with its filter mounted above it. The second photo shows the exhaust port on the bottom (yellow arrow) from which the air and moisture are ejected. To eliminate this debris being blown up and away, an American Coach owner suggested buying a short (6” or 15cm) length of 4” (10cm) black plastic drain pipe and cutting it in half along its length. Mount the half piece using a ‘L’-bracket with the curve side up, below the Air Dryer exhaust (see yellow arrow in the second photo) to deflect the exhausted air. The Red Arrow in the second photo shows the deflector as it is mounted below the Air Dryer. The exhausted air will sound different, however the air blast will no longer blow the gravel or dust up. As he says ‘Simple, Cheap and no more debris kicked up.” I agree! One common issue with large fuel tanks mounted on a motorhome chassis is that the fuel filler is almost level with the top of the tank. When filling, the fuel often foams and ‘spits back’ out the filler. The excess fuel runs down the exterior of the coach body onto the ground. It seems that no amount of care will stop this from occurring. 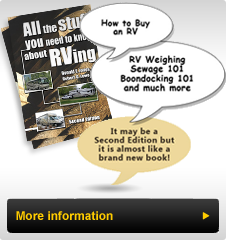 In the June, 2017 issue of MotorHome magazine, long time RVer, John Merlot provided a simple and effective solution. He suggested taking a single paper towel sheet and folding it lengthwise until it is a 2” (5cm) wide band. Fully wrap this paper towel band around the top of the filler nozzle as shown in the photo. Then insert the nozzle into the fuel filler and pump the fuel as usual. If you wish to use the lock on the nozzle to save having to hold the fill lever, then do so. When I use this technique, I make it a habit to slow down the fill rate as I approach the amount of fuel I expect the tank to take. When the tank is full the auto stop filler will click off the flow. Simply withdraw the nozzle and discard the damp paper towel into the nearby trash container. I have learned that the half paper towel size is just right. It is easier to fold two or three times to get to the size that works well for wrapping around the nozzle. Being curious about why this simple approach is so effective, I have noticed that the air that is exhausted from the tank as fuel is pumped in, comes out with much more force (since there is less space for this air to come through). I’ve also noticed that there is no fuel foam in the filler tube after removing the nozzle. Both indicate that this procedure forces air out the tank vent and the filler tube instead of through the fuel. As you can see from the amount of paper towel that is damp, there is very little fuel ‘wasted’. There is no longer any fuel ‘spit back’, no additional clean up and much less hassle filling the tank. I’ve being using this technique since I read about it and I concur with John that it is simple and effective. If you have a coach which suffers from fuel ‘spit back’, try this technique and see if you agree with John and I, that it works every time! While these two tips are for those with diesel powered coaches, we look forward to others that apply to gas or all coaches. If you have any suggestions, send me an email using the link on our website and we’ll consider using it in future Technical Tip articles.